This is 380 Auto Barnes TAC-XPD 80gr. 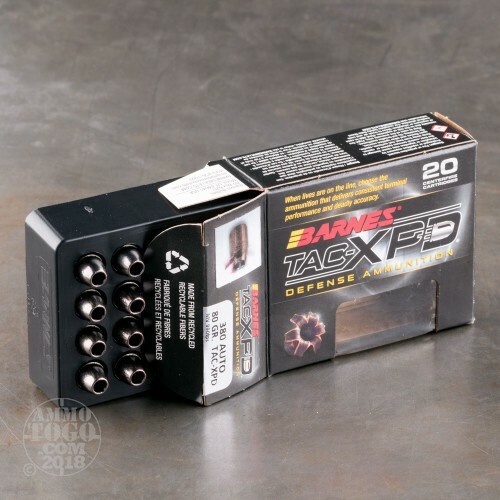 TAC-XP Hollow Point Ammo. The optimized solution for personal and home defense. 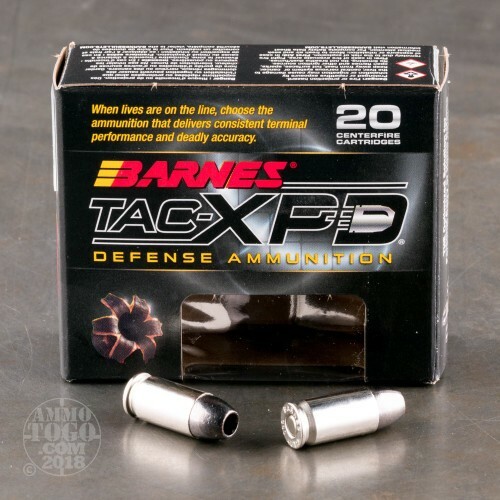 Loaded with the venerable Barnes TAC-XP bullets, TAC-XPD ammunition is engineered and designed to deliver top performance when it is most critical: in life-threatening situations the TAC-XP’s all-copper construction and very large, deep hollow-point cavity expand, penetrate and perform more consistently than any personal defense product on the market. This ammo is brass cased, nickel coated, boxer primed, non magnetic and non corrosive. This ammo comes packaged 20rds. to a box. Muzzle Velocity: 990 FPS. 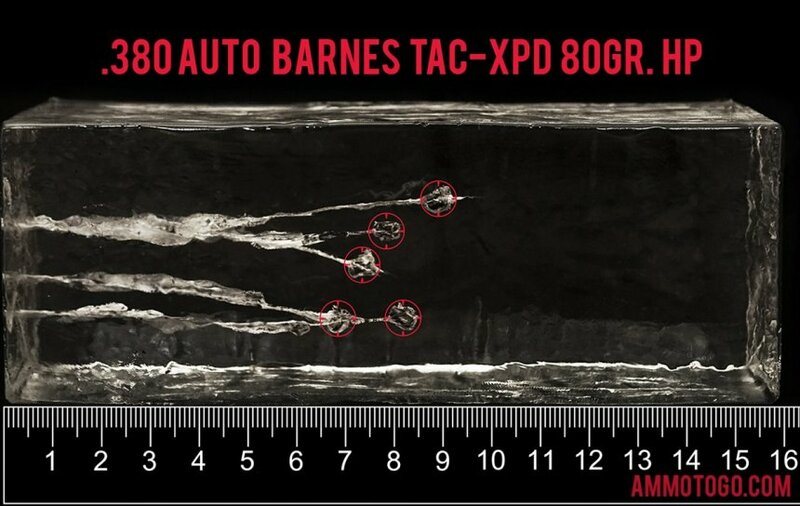 We fired five rounds of this Barnes Bullets 380 Auto (ACP) ammo through a cloth barrier into Clear Ballistics calibrated synthetic gelatin and recorded the results. For these tests, we used a Ruger LCPII with a 2.75-inch barrel. In the photos, graphics and video on this page, you can see specifically how the Barnes Bullets ammo performed and how it sticks up with the rest of the 380 Auto (ACP) ammo we have tested so far. 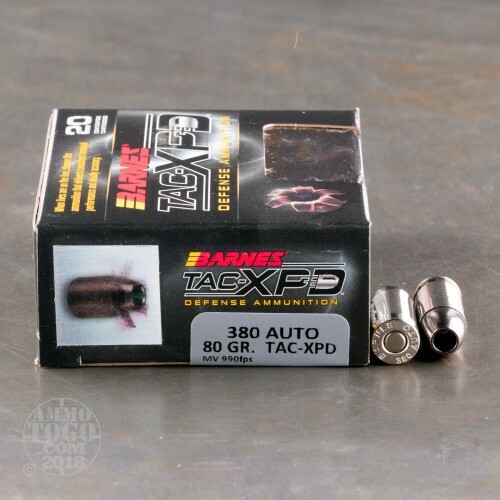 How do the results for this Barnes Bullets 380 Auto (ACP) compare to other 380 AUTO? 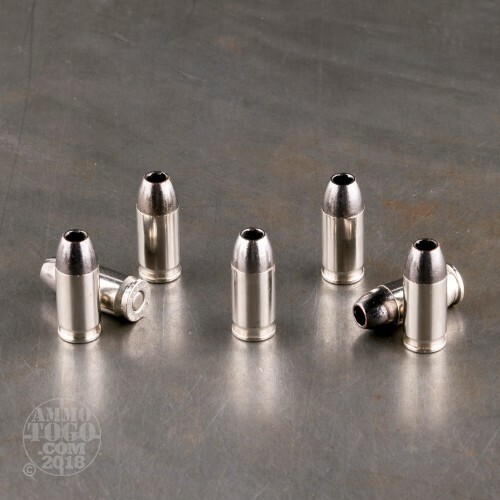 Expansion Diameter Compared to All 380 Auto (ACP) Ammo Tested MIN 0.35" MEDIAN 0.355" THIS AMMO 0.55" U.S. dime MAX 0.78"
Penetration Depth Compared to 380 Auto (ACP) Tested 0" 10" 20" 30" MIN 6.5" MEDIAN 13.3" THIS AMMO 8.1" MAX 28.7"
Three hundred reliable rounds through a Kimber Micro and SIG P238. Both control and muzzle flash are optimum for my wife's and daughter's pistol. I also use the same defense cartridge for my 3" Kimber Ultra without issue in 45 ACP. Tested this ammo out of the Glock 42. It does not cycle properly. I experienced a malfunction about 1 every 3 rounds. Obviously, not the load you want if you are running a Glock 42. Do not know how well it cycles in other 380 pistols. This ammo is too weak to cycle a Glock 42. Weak is not a word I want associated with a self defense round. If you have a Glock 42 this ammo will not work in it. Barnes knows of the issue seeing I called them to check on it. So save yourself the trouble and look at a different carry load.